How Drunk Do You Have To Be To Be Cited For Drunk Walking? 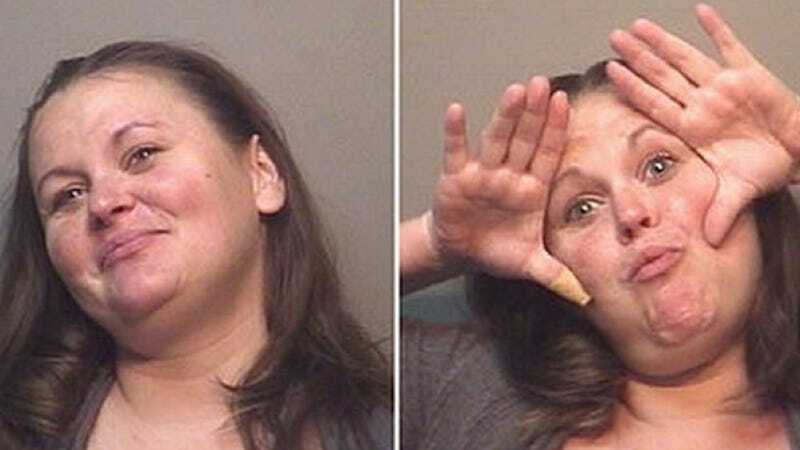 Sarah Grohman, of Humble, Texas, which is near Houston, which figures, had fun playing peek-a-boo with the nice person taking the mugshot camera, who was taking her mugshot because she had just been arrested for child endangerment. No, she was not playing peek-a-boo with her child. All she had been doing was going out for a walk. With her child. While drunk. A concerned citizen called authorities on April 22, 2014 to report that the mother, who appeared to be intoxicated, was pushing a stroller in the 1200 block of S. Houston Ave. about five feet away from a busy roadway. The witness said the mother had fallen over, causing the baby to fall out of the stroller. And she wasn't even wearing a sombrero. Amazing. The baby was examined by EMS at the scene, and was released to Child Protective Services.